Fine Gael gaining second preference transfers across the campaign. Evaluation of claimed second preference vote behaviour, allows us to try and better understand how transfers may pan out on Election Day. Across the four polls conducted in February by RED C we see Fine Gael on course to secure 28% of second preference votes, with strongest transfer coming from Labour candidates that are eliminated. Given that Labour are perhaps running two many candidates in some seats now, based on their national share this may help Fine Gael “second or third seat” candidates. 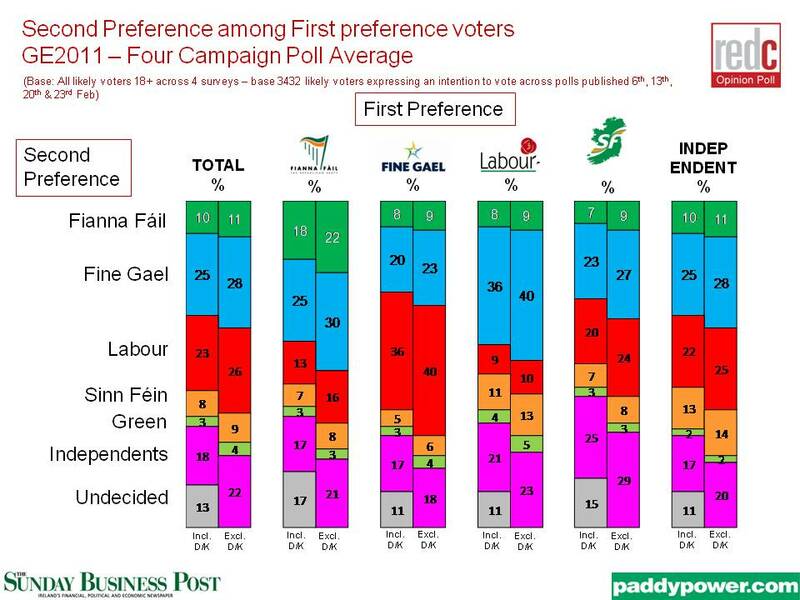 It is also important to note that the trend across the four polls has been a gradually increasing second preference share for Fine Gael in line with their first preference trends. Labour are the next highest beneficiary of transfers, securing 26% second preference share overall on average across the four polls, meaning they are almost as likely as Fine Gael to get transfers. 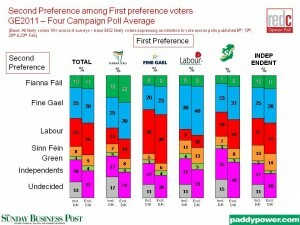 This is well ahead of current first preference share and suggests a significant seat bonus. However their main supplier is Fine Gael first preference, and as such they would have to see a Fine Gael candidate eliminated to get this share of transfers. They do also get good transfers form Sinn Fein and Independent candidates, but it is behind that expected for Fine Gael. The Labour share of transfer has also been declining over the campaign. 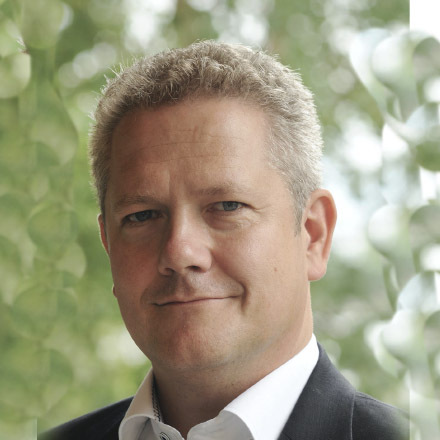 Independent candidates take 22% of the second preference share, putting them in third place overall, but as there are so many candidates, this is likely to be fragmented down again to their own second preferences. Fianna Fail secure just 11% of the second preference share, and this suggests they will not get any kind of seat bonus, with only their own candidates transferring at more than 10%. Their second preference share has also been declining throughout the campaign. Sinn Fein secure an average 9% second preference share across the four polls, with the best transfers coming from Labour and Independent/Other parties. This share has been relatively stable throughout the campaign. Finally, the Greens secure just 4% of second preferences, and will have to hope that they have done enough to persuade voters to at least put them further down the ballot sheet.